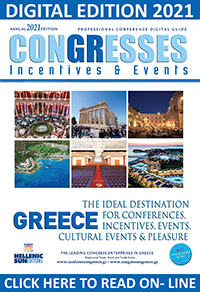 The organization of many events of great importants has acted as a springboard for increased investments in the all aspects of the travel industry with focus on the meetings, conference and trade-fair sector in Greece. Accordingly, in the exhibition and conference construction and design market, a large number of professionals make continuous attempts to prepare the best environment possible for their customers, especially nowadays when the service quality defines the standard of the events and plays a much more important role than ever. In a bid to create original designing and constructive solutions with impressive results in the evaluation, design and organization of any event, the Greek professionals of the contemporary exhibition and conference market offer an increasing variety of related services combined with special knowledge and expertise. The companies are staffed with expert professionals from a variety of backgrounds and departments, including architectural and electronic design, production and integration of multimedia presentation, as well as experienced craftsmen in all relevant construction fields. Furthermore, most of the sectorβs companies own in-house facilities, including autonomous factories and workshops, graphics departments, storage and transportation facilities. The sectorβs professionals already boast a long experience in the development and delivery of small as well as major exhibitions and conferences, having gained the confidence of large multinational companies that entrust them with the design and construction of custom exhibits and generally their corporate image and presence in the events. They offer unique design, digital age marketing proposals and international support, all of them on the basis of latest generation technology.